If you haven't read it here before, read it now: I LOVE CAMP. You can search my website and see how many times I talk fondly of my days as a camper. Nothing makes me happier than to learn about camps now accommodating gluten-free campers with ease. Camp Eagle Hill is a beautiful and modern two hundred acre facility located just ninety miles north of New York City in the foothills of the Berkshire Mountains. They are very proud of their many new camp areas and facilities. Recently, Camp Eagle Hill completely renovated all of their girls’cabins, added a large Dance Studio, built a new Cooking Area, added a Technical Theatre Area, and built a new climbing tower and zip line. They also built a brand new baseball field with a beautiful dirt infield. The camp facility is filled with great activity areas and each year they add to their facility and program. NEW FOR 2012: A dedicated gluten free kitchen. The Camp Eagle Hill gluten-free menu will echo their regular food service menu and allow gluten free campers to enjoy the same meals eaten by all of campers every camp day. Camp Eagle Hill offers a well rounded program with a combination of group and individually selected activities. They have a full Sports program (with a tremendous gymnasium), extensive arts program, lots of waterfront activities, a strong performing arts program, campouts, trips, special events and much more. Camp Eagle Hill has a very large adult Staff and offers excellent supervision and instruction. Small camp groups at Eagle Hill allow for extra attention and care for the individual camper. Many large indoor areas help to eliminate any rainy day problems! Most important, they have a Directorship that will know and care for each child and help him/her to enjoy a great camp experience! The Camp Eagle Hill facilities include: a beautiful lake and 2 pools, 2 baseball fields, 2 soccer fields, 5 basketball courts, 8 tennis courts, 3 volleyball courts, a hockey rink, a large multi-purpose gymnasium, a tremendous recreation hall/canteen, a large Arts Center, a Theatre Arts Building, go-karts track, archery area, dance studio, climbing tower and zip line area, gymnastics pavilion, mountain biking trails, a beautiful overnights campsite and more. 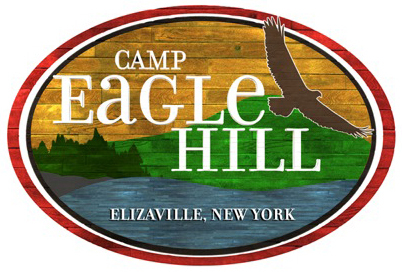 Please visit the Camp Eagle Hill website today for more information.